buyviews.info's web design is quite simple yet very tasteful and user-friendly. You can find all their services very easily when you scroll down the front page. We enjoyed the fact that there weren't lots of color on the main page because it made the content written readable and the site itself very clear and easy on the eyes. This supplier's prices are quite average and they seem to be right in the middle of the price range. Apart from the regular prices, we didn't see any deal packages, which we found very strange and disappointing because most of the competitors on the market do indeed offer packages that are better deals than purchasing an individual service every time. Their claim for 'lowest prices guaranteed' is false since we have previously reviewed cheaper service providers. This vendor accepts payment via PayPal, Perfect Money, Bank Wire, Western Union and Web Money. It's too bad that while on other sites you can pay with credit cards, they didn't offer an option to do it. 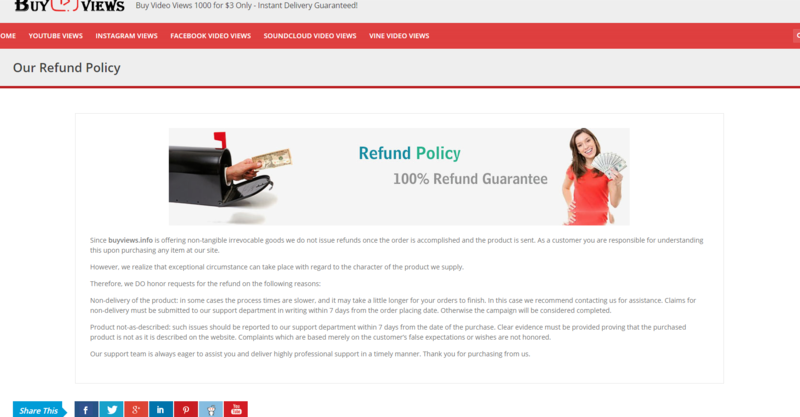 Their refund policy is also very confusing: on the one hand they clearly state they don't issue refunds once a transaction is completed and delivered, yet on the other hand, they advertise themselves giving 100% refund guarantee. The delivery experience was very, very disappointing. In contrast to the organized look of the site, orders processing, handling, and delivering is a very messy ordeal. 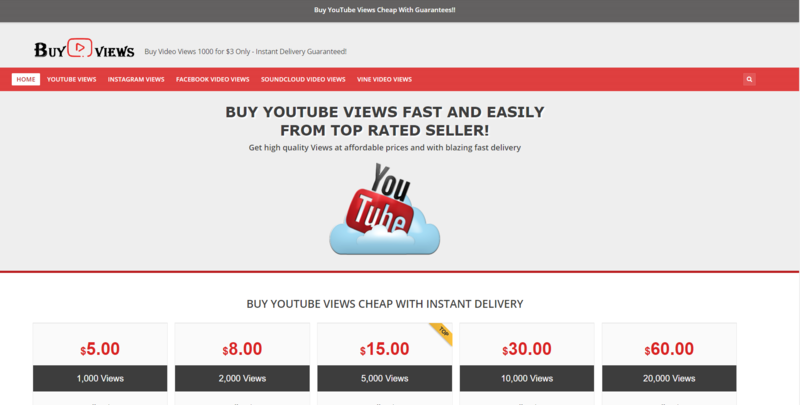 buyviews.info's delivery time takes much longer than we expected. Our 3,000 views order and separate 500 subscribers order were provided only after five weeks, which is practically unheard of in this business. During this time we contacted the site and were promised several times that the order would be completed immediately, yet we still kept waiting for over a month. After we had already received our order, the story still didn't end because that's when the drops began. We experienced drops in our subscribers and our views, and it took them a long time to refill these orders. Even after they refilled these orders, we still experienced more drops. It took them a total of 7 weeks to fully deliver our order! Their website claims the support team is available 24/7 and that could have been really helpful, but actually their support team responded to us after a few days had passed since we contacted them. The longest it took them to reply to our messages was a whole week. Because of all the mess that happened with our orders, we expected a much better response and immediate reassurance that they are aware of our issues and are working to resolve them. We believe buyviews.info's support team can definitely do a better job. The site features very little information about this seller's services. Although there is an FAQ page, it contains no information about delivery times or how they provide their services. The only information that exists is how you can pay for their services and that you can contact them. In addition, as we've mentioned earlier in this review, their refund policy is a little unfair, very confusing and doesn't match their "100% guarantee" statement at all. buyviews.info's final score is 40/100. Despite the very average prices and the user-friendly design of the site, there were many disadvantages. For starters, there's the lack of information on the site - it is not possible for a potential customer to find information about important aspects of making a transaction with them (like delivery time). Another thing we weren't happy with is that there are no deal-packages that include a number of YouTube services for a reasonable price. Besides all these, the services delivery time took too long, with a very low level of customer service. They must add more information about YouTube services in the form of FAQs or blogs and step up their customer service game.